American Skin Association - Howard and Abby Milstein Foundation. As Chairman of the Board of the American Skin Association, Howard Milstein has brought stability to the organization, increased its assets and sharpened its focus on cancer and melanoma. As such, he is in the vanguard of those who are working to combat the deadly effects of climate change on the skin. In order to accelerate the search for prevention and cure, the Abby S. and Howard P. Milstein Innovation Award for Melanoma/Non-Melanoma Skin Cancer Research, launched in 2008, is funding other advanced research via three-year fellowships through the American Skin Association. The Awards are available only to established leaders in the fields of dermatology and cutaneous oncology, who spend at least 80% of their professional time engaged in research. The groundbreaking research is focused on new discoveries in the basic and clinical sciences with current or potential impact on the understanding and treatment or prevention of melanoma/non-melanoma skin cancers. 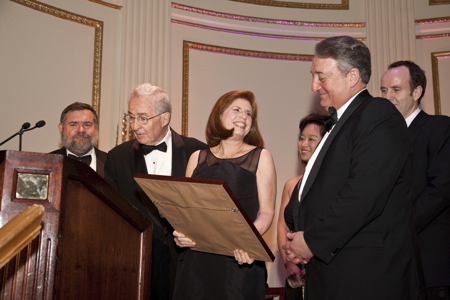 Prior to inaugurating the Milstein Innovation Awards, the family funded breakthrough melanoma and non-melanoma skin cancer research by seven scholars in key centers around the U.S.
Howard P. & Abby S. Milstein were presented with the American Skin Association's Humanitarian Award, the organization's highest award, by ASA Founder and President George W. Hambrick, Jr., MD, on October 26, 2010, at the ASA's 12th Annual Gala in New York City.